Startupbootcamp FastTracks are informal events that we host all over the world to meet the most suitable early-stage companies interested in joining our program. For each FastTrack, we invite the top 10 startups who apply to receive instant feedback from a panel of industry mentors, network with our investment team and find out more about the program. Teams that attend a FastTrack are 20% more likely to be invited to the final selection days. 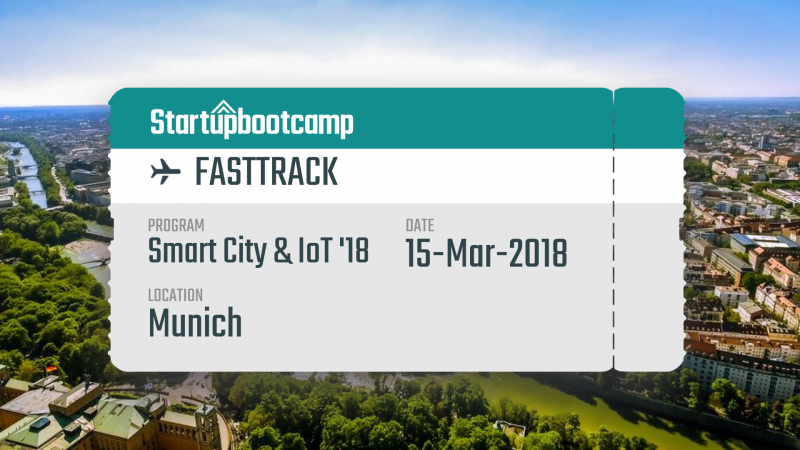 On the 15 March 2018, the Startupbootcamp Smart City & IoT program welcomes you in Munich for a FastTrack day as part of its international tour to support the area’s best talents in the industries of Smart City and IoT. We are specifically interested in the following technologies: Open Data, Big Data & Analytics; AI & Machine Learning; AR & VR; Drones; Blockchain; IoT and Cyber Systems; Cloud; Network & Communications; Mobile Applications. The experience is extremely valuable for everyone attending: teams learn from personalized feedback they get as well as from feedback that other teams receive. As the event is informal, you will also have the chance to connect with the mentors and other participating teams from the local ecosystem.